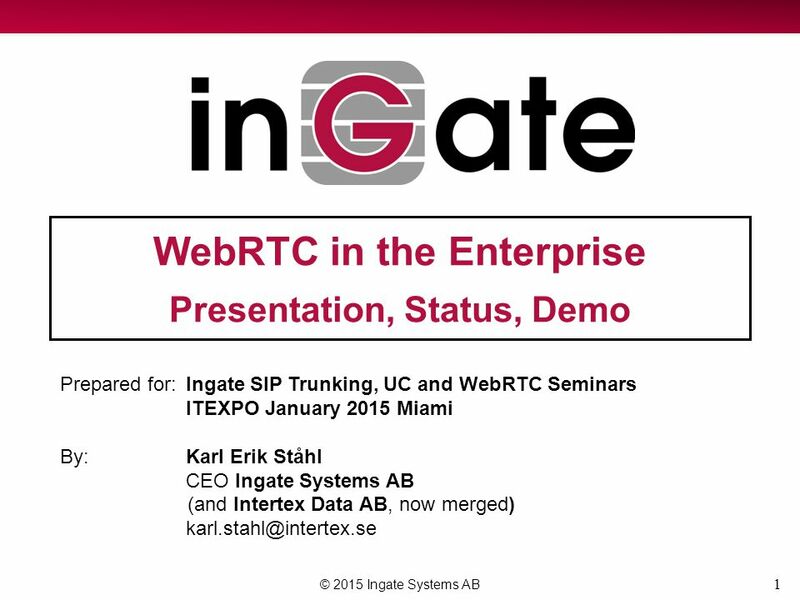 1 WebRTC in the Enterprise Presentation, Status, Demo © 2015 Ingate Systems AB Prepared for:Ingate SIP Trunking, UC and WebRTC Seminars ITEXPO January. 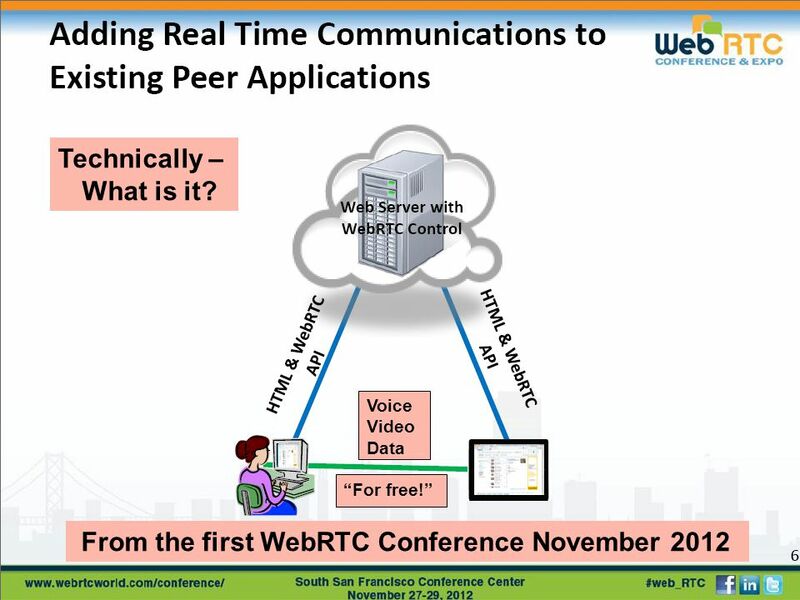 3 3 Voice Video Data “For free!” From the first WebRTC Conference November 2012 Technically – What is it? 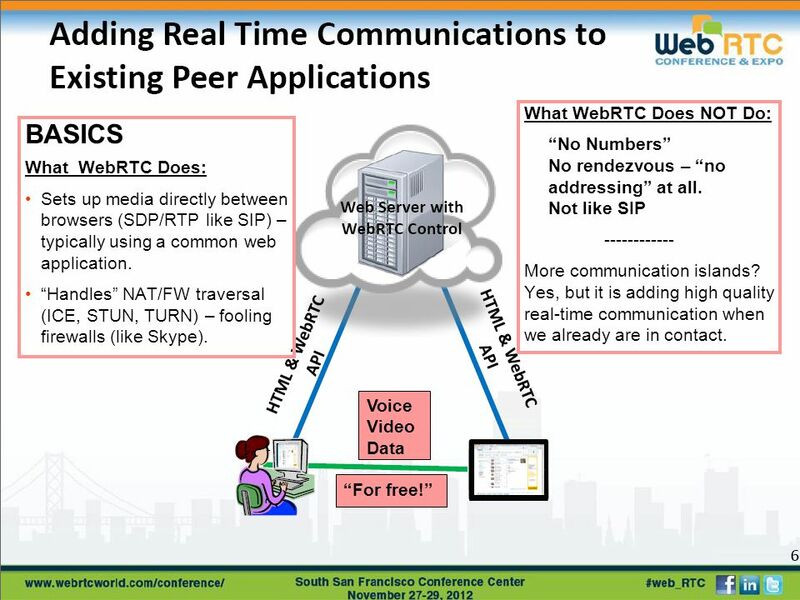 4 4 BASICS What WebRTC Does: Sets up media directly between browsers (SDP/RTP like SIP) – typically using a common web application. “Handles” NAT/FW traversal (ICE, STUN, TURN) – fooling firewalls (like Skype). Voice Video Data “For free!” What WebRTC Does NOT Do: “No Numbers” No rendezvous – “no addressing” at all. Not like SIP ------------ More communication islands? Yes, but it is adding high quality real-time communication when we already are in contact. 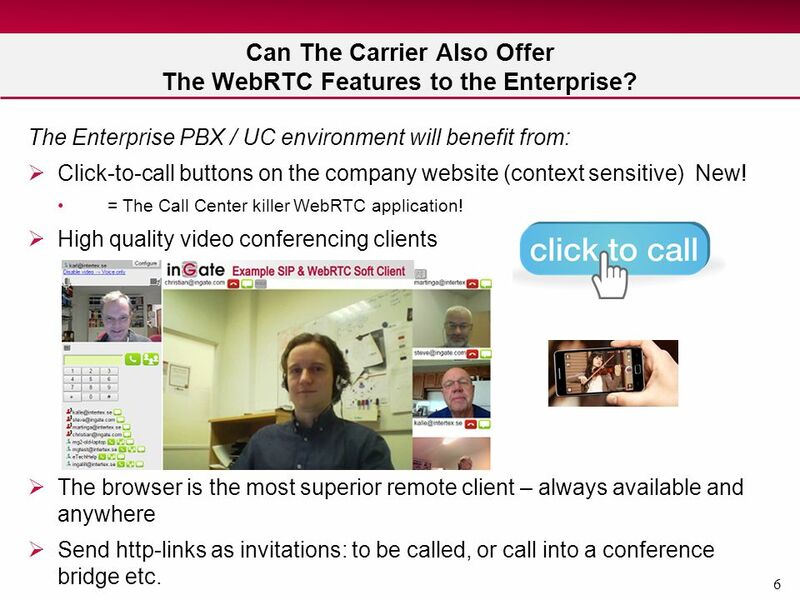 6 6 Can The Carrier Also Offer The WebRTC Features to the Enterprise? The Enterprise PBX / UC environment will benefit from:  Click-to-call buttons on the company website (context sensitive) New! 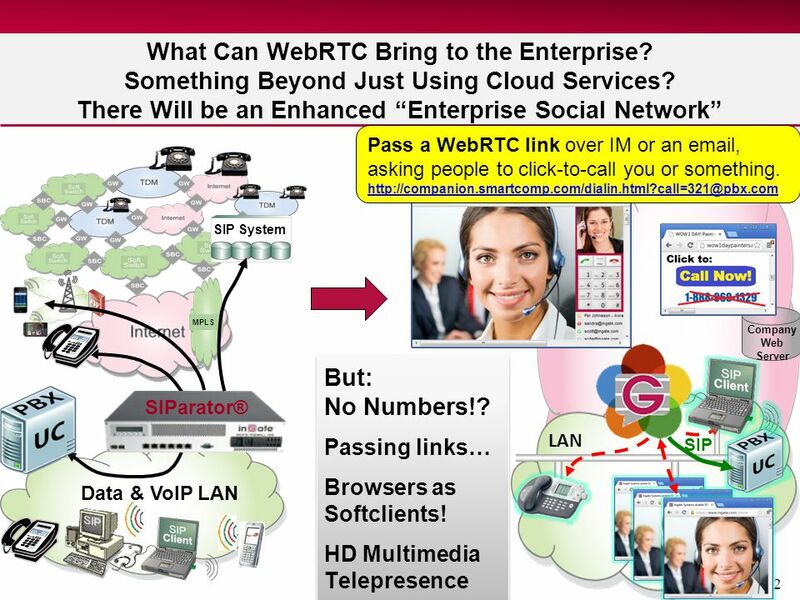 = The Call Center killer WebRTC application!  High quality video conferencing clients  The browser is the most superior remote client – always available and anywhere  Send http-links as invitations: to be called, or call into a conference bridge etc. 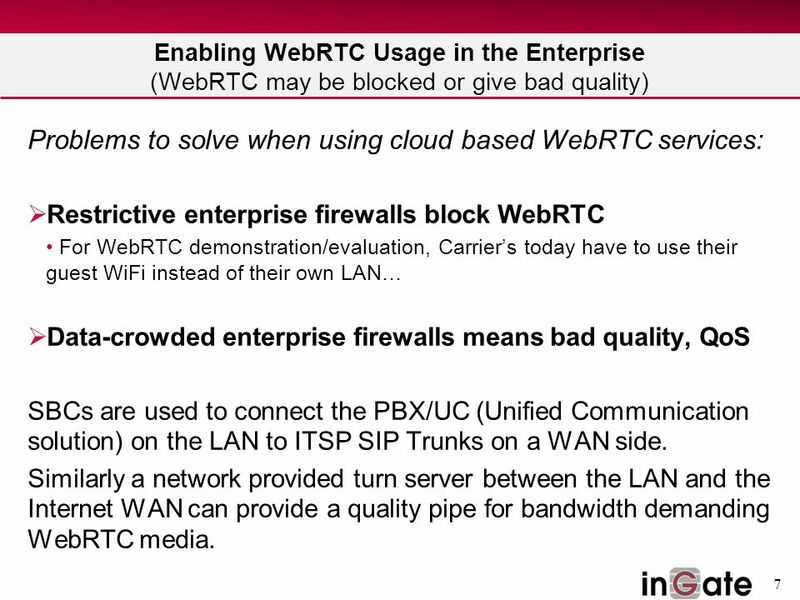 7 7 Enabling WebRTC Usage in the Enterprise (WebRTC may be blocked or give bad quality) Problems to solve when using cloud based WebRTC services:  Restrictive enterprise firewalls block WebRTC For WebRTC demonstration/evaluation, Carrier’s today have to use their guest WiFi instead of their own LAN…  Data-crowded enterprise firewalls means bad quality, QoS SBCs are used to connect the PBX/UC (Unified Communication solution) on the LAN to ITSP SIP Trunks on a WAN side. Similarly a network provided turn server between the LAN and the Internet WAN can provide a quality pipe for bandwidth demanding WebRTC media. 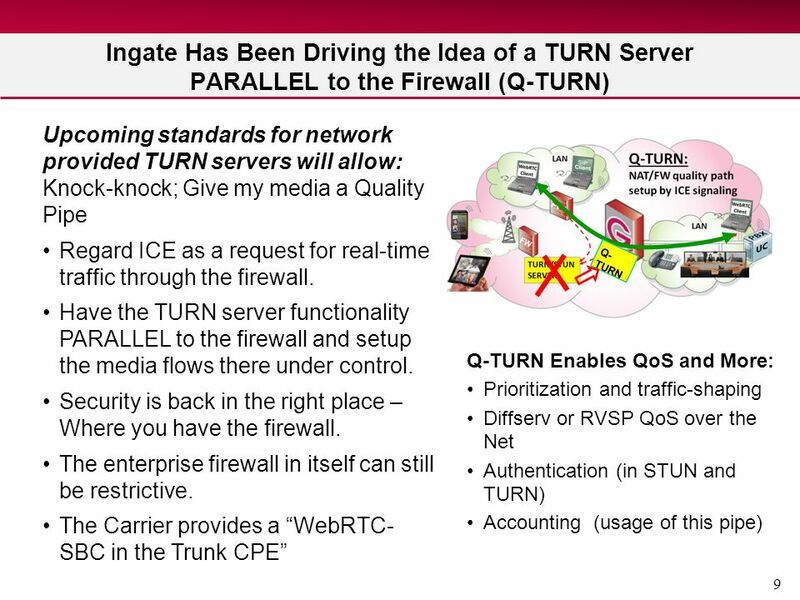 10 10 Ingate Has Been Driving the Idea of a TURN Server PARALLEL to the Firewall (Q-TURN) Upcoming standards for network provided TURN servers will allow: Knock-knock; Give my media a Quality Pipe Regard ICE as a request for real-time traffic through the firewall. Have the TURN server functionality PARALELL to the firewall and setup the media flows there under control. Security is back in the right place – Where you have the firewall. The enterprise firewall in itself can still be restrictive. The Carrier provides a “WebRTC- SBC in the Trunk CPE” Q- TURN Q-TURN Enables QoS and More: Prioritization and traffic-shaping Diffserv or RVSP QoS over the Net Authentication (in STUN and TURN) Accounting (usage of this pipe) Q-TURN (a Network Provided TURN server) will be added in future releases of the Ingate SIParator®. 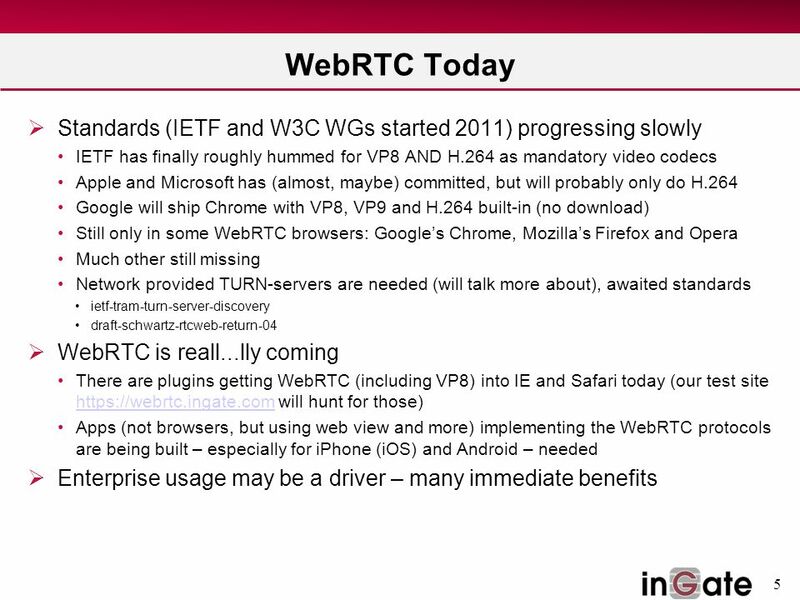 Awaiting standards to be used by browsers: ietf-tram-turn-server-discovery draft-schwartz-rtcweb-return-04 WebRTC browsers will then use the network provided TURN server crossing the enterprise firewall. 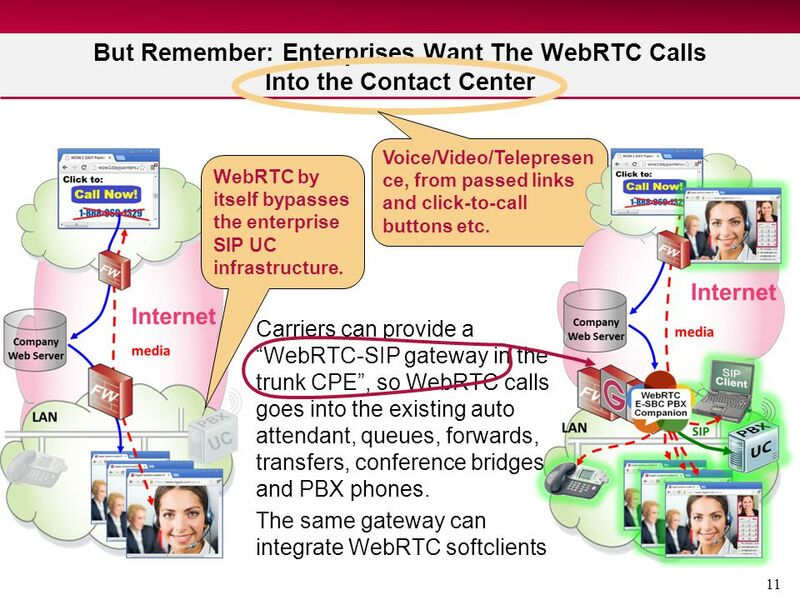 11 11 But Remember: Enterprises Want The WebRTC Calls Into the Contact Center Carriers can provide a “WebRTC-SIP gateway in the trunk CPE”, so WebRTC calls goes into the existing auto attendant, queues, forwards, transfers, conference bridges and PBX phones. 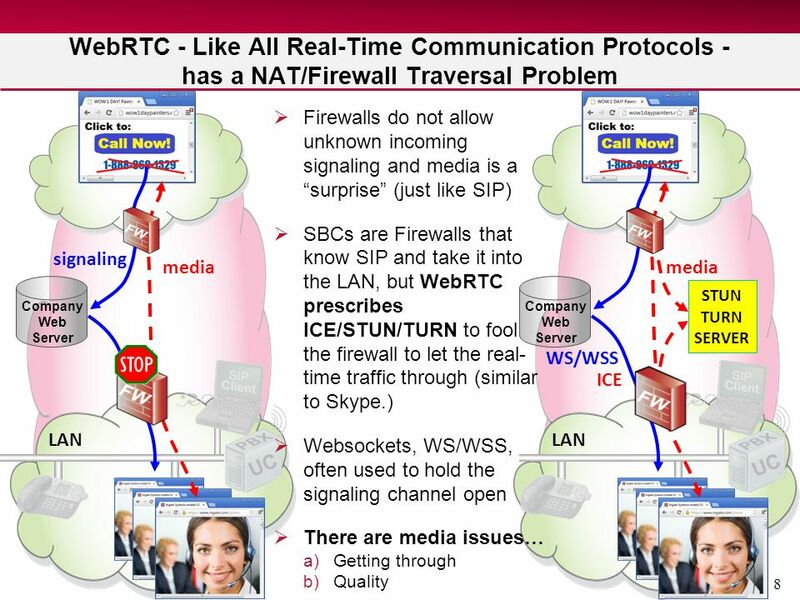 The same gateway can integrate WebRTC softclients WebRTC by itself bypasses the enterprise SIP UC infrastructure. Voice/Video/Telepresen ce, from passed links and click-to-call buttons etc. 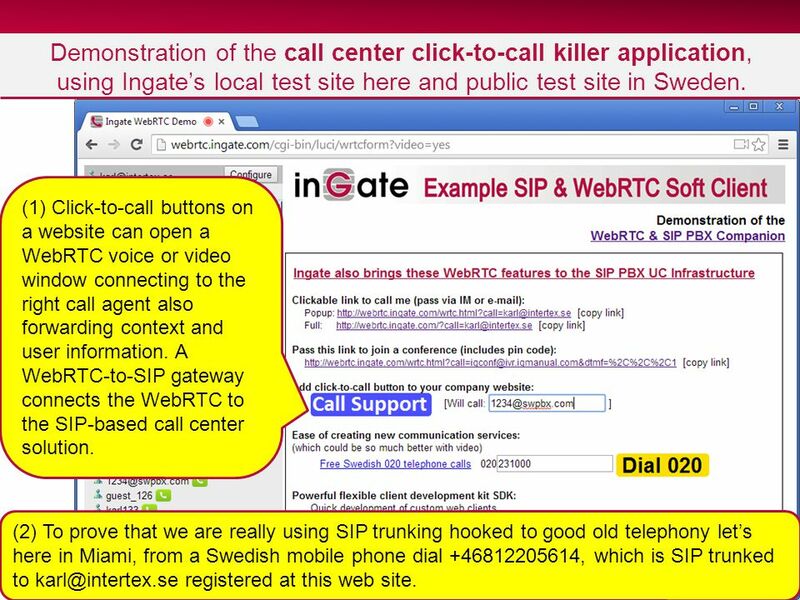 12 12 Ingate’s public test site is on a WebRTC–SIP gateway combined with an E-SBC. Let’s see WebRTC’s “social calling without numbers” When the receiver (e.g. via IM or email) of this link clicks it, a window pops-up and sets up a video conference between our WebRTC browsers. No numbers, no SIP, no PSTN involved. 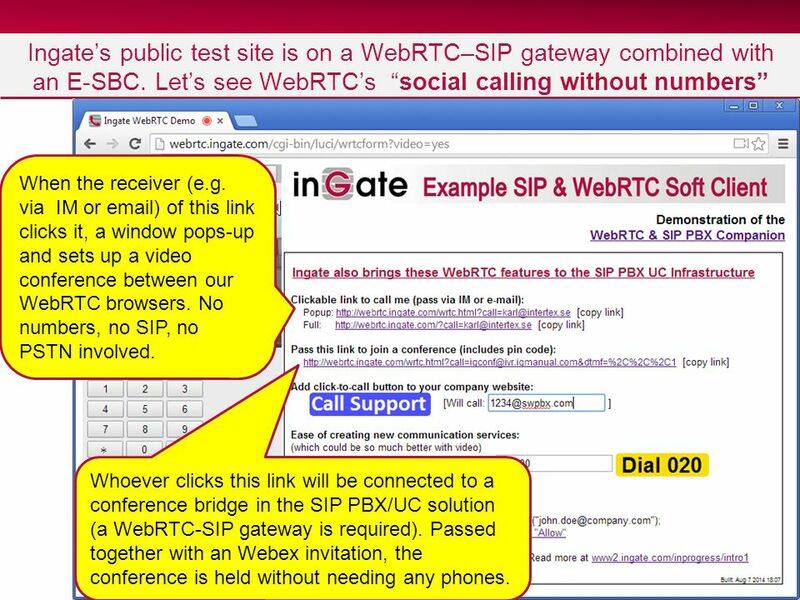 Whoever clicks this link will be connected to a conference bridge in the SIP PBX/UC solution (a WebRTC-SIP gateway is required). Passed together with an Webex invitation, the conference is held without needing any phones. 13 13 Demonstration of the call center click-to-call killer application, using Ingate’s local test site here and public test site in Sweden. (1) Click-to-call buttons on a website can open a WebRTC voice or video window connecting to the right call agent also forwarding context and user information. A WebRTC-to-SIP gateway connects the WebRTC to the SIP-based call center solution. (2) To prove that we are really using SIP trunking hooked to good old telephony let’s here in Miami, from a Swedish mobile phone dial +46812205614, which is SIP trunked to karl@intertex.se registered at this web site. 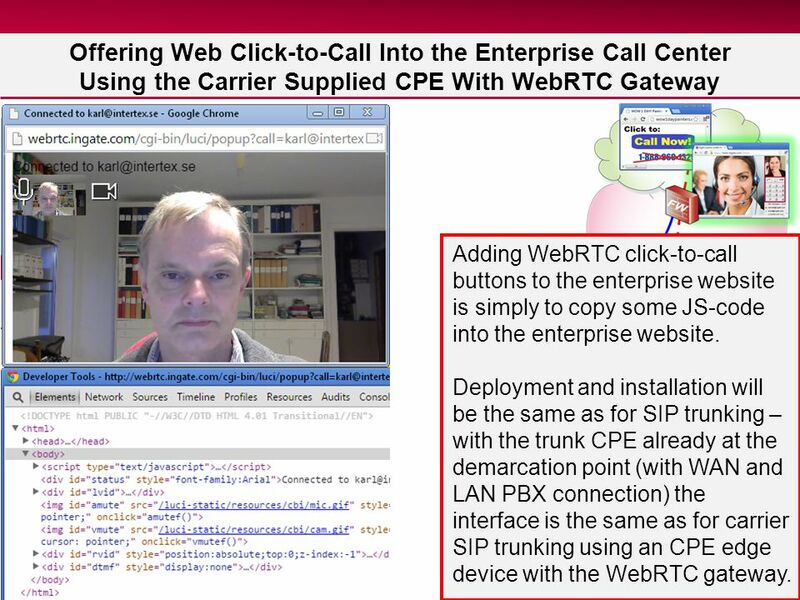 14 14 Offering Web Click-to-Call Into the Enterprise Call Center Using the Carrier Supplied CPE With WebRTC Gateway Adding WebRTC click-to-call buttons to the enterprise website is simply to copy some JS-code into the enterprise website. Deployment and installation will be the same as for SIP trunking – with the trunk CPE already at the demarcation point (with WAN and LAN PBX connection) the interface is the same as for carrier SIP trunking using an CPE edge device with the WebRTC gateway. 15 15 The WebRTC Browser as a Softphone Having the PBX/UC softphone available everywhere, on every device that has a browser, without any plug-in and not just for plain voice phone calls, but potentially also for HiFi HD telepresence-quality videoconferencing, is of course a dream. This is an obvious WebRTC application for the enterprise PBX or UC solution. It will especially ease remote PBX/UC usage, since WebRTC includes the NAT/Firewall traversal method (ICE/STUN/TURN) in itself. A WebRTC-SIP gateway is required Ingate’s Companion gateway has most of the softclient and an SDK built-in, allowing customized clients to be easily built. 16 16 Demonstration of HD Telepresence Quality Video Conferencing, using Ingate’s public test site in Sweden. This has only been available with 100 kUSD equipment in special rooms before Soon at everyone’s desktop and pocket. Save flight tickets and other travel for quality meetings The WebRTC browser gives a quality only before seen in expensive telepresence systems before. Here a conference between a SIP-connected browser client, two laptop WebRTC browsers, a mobile Galaxy S5 using Chrome browser and Ms. Time telling time in Sweden at telephony number 90510. 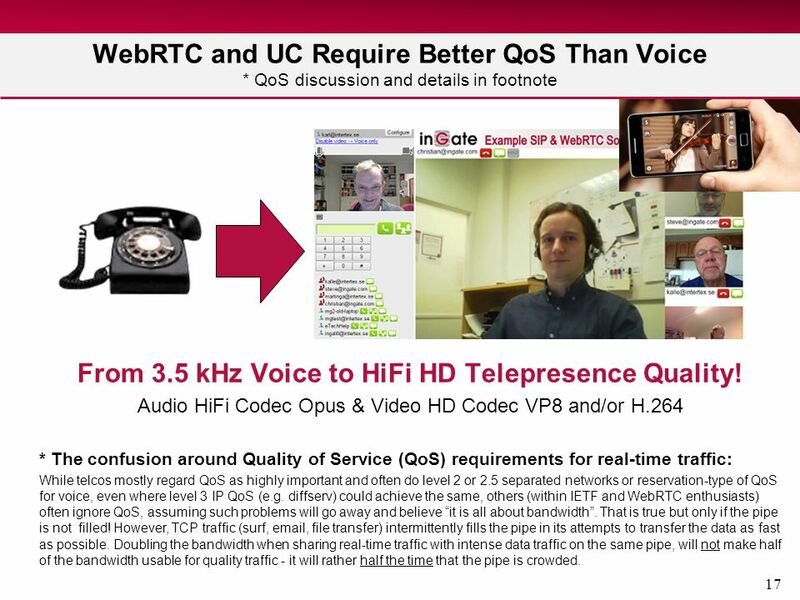 17 17 WebRTC and UC Require Better QoS Than Voice * QoS discussion and details in footnote From 3.5 kHz Voice to HiFi HD Telepresence Quality! Audio HiFi Codec Opus & Video HD Codec VP8 and/or H.264 * The confusion around Quality of Service (QoS) requirements for real-time traffic: While telcos mostly regard QoS as highly important and often do level 2 or 2.5 separated networks or reservation-type of QoS for voice, even where level 3 IP QoS (e.g. 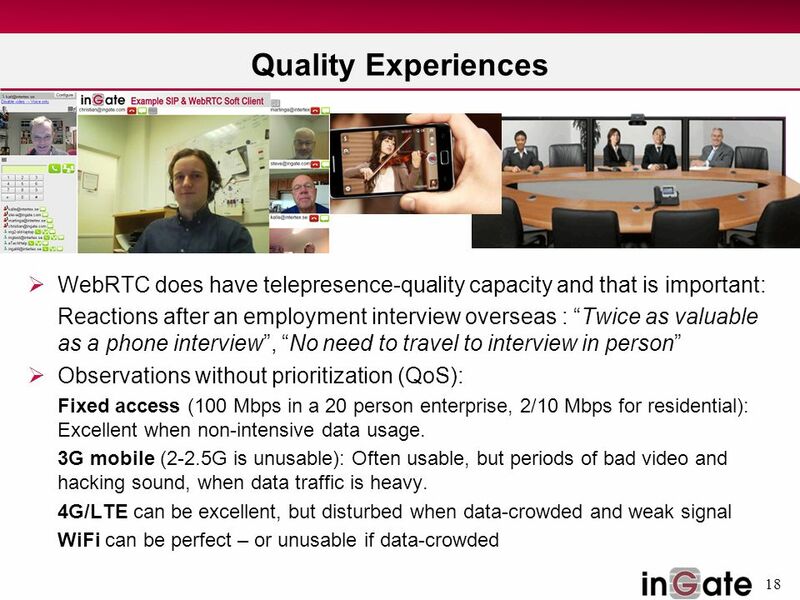 diffserv) could achieve the same, others (within IETF and WebRTC enthusiasts) often ignore QoS, assuming such problems will go away and believe “it is all about bandwidth”. That is true but only if the pipe is not filled! However, TCP traffic (surf, email, file transfer) intermittently fills the pipe in its attempts to transfer the data as fast as possible. Doubling the bandwidth when sharing real-time traffic with intense data traffic on the same pipe, will not make half of the bandwidth usable for quality traffic - it will rather half the time that the pipe is crowded. 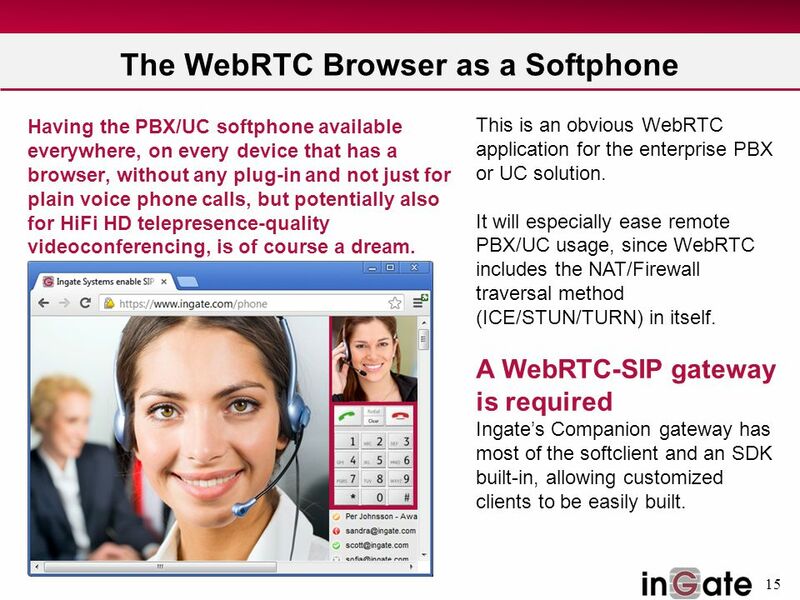 Download ppt "1 WebRTC in the Enterprise Presentation, Status, Demo © 2015 Ingate Systems AB Prepared for:Ingate SIP Trunking, UC and WebRTC Seminars ITEXPO January." Insert Tradeshow or Event Name -- Date Insert Presentation Title Trends in Instant Messaging and Telephony Jonathan Rosenberg Chief. Unleashing the Power of IP Communications Calling Across The Boundaries Mike Burkett, VP Products April 25, 2002. 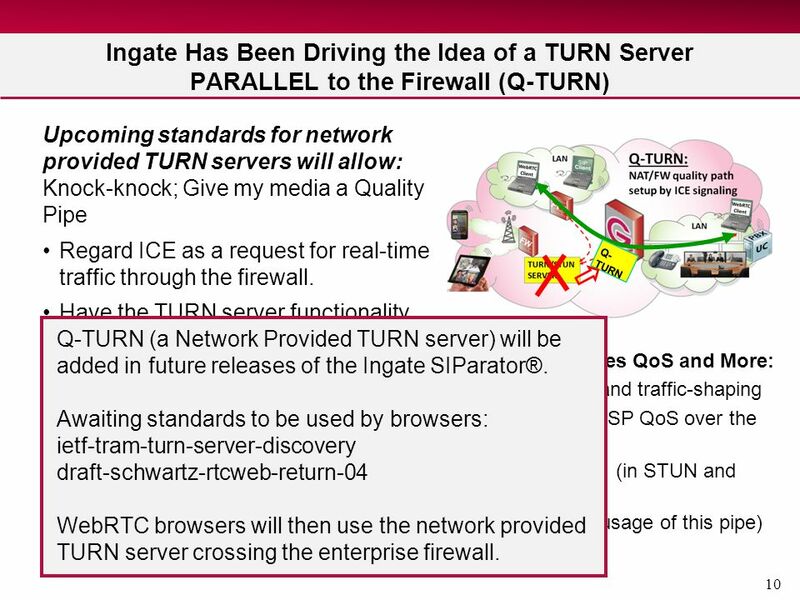 1 TURN Server for WebRTC in the Firewall © 2014 Ingate Systems AB Prepared for:Ingates SIP Trunking, UC and WebRTC Seminars ITEXPO January 2014 Miami By:Karl. Enterprise-Centric UC Live Unified Communication Beyond the Borders © 2010 Intertex Data AB 1 Prepared for:INTERNET TELEPHONY Conference Ingates SIP Trunk-UC. Addressing Security Issues IT Expo East Addressing Security Issues Unified Communications SIP Communications in a UC Environment. 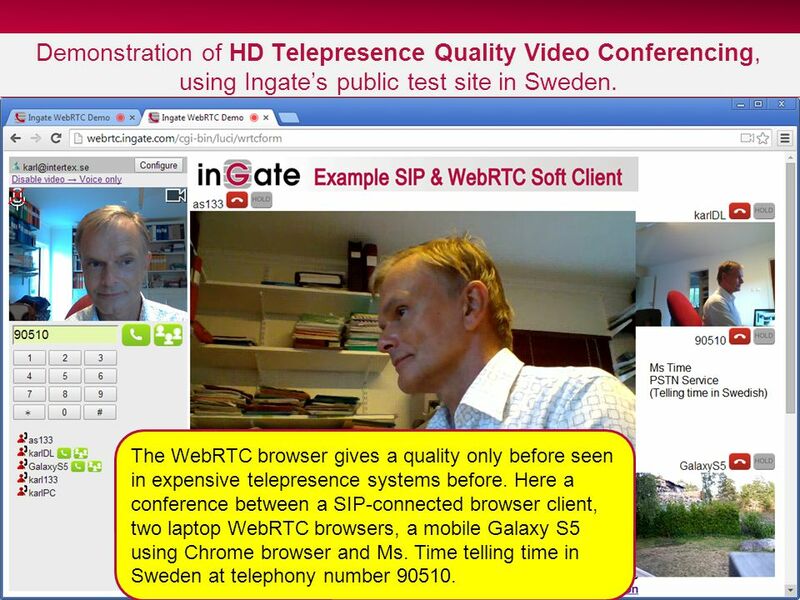 1 WebRTC in the Enterprise Presentation, Status, Demo © 2014 Ingate Systems AB Prepared for:WebRTC Pavilion ITEXPO August 2014 Las Vegas By:Karl Erik Ståhl. Intertex Data AB, Sweden VoIP to the Edge: Firewalls - The Missing Link Prepared for:Voice On the Net, Fall 2001 By: Karl Erik Ståhl President Intertex. © 2013 Ingate Systems AB 1 Prepared for:ITEXPO Conference, Las-Vegas, August 2013 By: Steven Johnson President Ingate Systems Inc. Also.